Leaving Montrose, US Hwy 550 follows the Uncompahgre River. About three miles south of town is the Ute Indian Museum (intersection of Chipeta Road and US-550). There is a lovely picnic area and a self-guided native plant garden tour. The museum itself is located on the original 8.65-acre homestead once owned by the famous Southern Ute Chief Ouray and his wife, Chipeta. The museum houses one of the most complete collections (click here for a virtual tour) of the Ute people and is a gathering point for visitors on the way to the Delta Powwow held in September each year. Nineteen miles south of the Ute Indian Museum is the entrance to Ridgway State Park. It features a large reservoir with a sandy beach. Ridgway is known as one of the nation's most accessible recreation areas for people with disabilities. One lodging option is to book one of the six-person yurts, canvas-walled structures inspired by tents used by nomads of the Mongolian and Siberian steppes. Ridgway's yurts have views of the towering Sneffel's range, sometimes called the "Switzerland of America." A community pool fed by a natural hot spring is nearby. To the east of the park is a county road that was once used as a cattle-drive trail in the late 1800s. Views from the area were used in the John Wayne films of "True Grit" and "How the West Was Won." A view of Ouray from the "Million Dolar Highway"
The San Juan Skyway, joins US-550 at Ridgway and begins the climb toward Ouray. Known as "the gem of the Rockies" this picturesque town is nestled in a tiny bowl surrounded by the rugged San Juan Mountains, known by the Ute Indians as the "Shining Mountains." Many of the streets are still unpaved, and the city's public swimming pool in the middle of town is a fed by a hot spring. The spring snow melt creates thunderous waterfalls on the cliffs surrounding Ouray. John Cletheroe, a resident of Norfolk, England who has traveled extensively in the Colorado mountains, provides wonderful photographs of Ouray and its environs on his site "USA and Canada Holiday Hints." There are a variety of explanations regarding the source of the name for the "Million Dollar Highway." One version claims it is based on the value of the ore-bearing fill that was used to construct the road, and another says it refers to the high cost of building a road over Red Mountain Pass (11,008 feet) and the Uncompahgre Gorge. One thing no one will dispute is the million dollar views around every turn. This marvel of engineering, designed by Russian immigrant Otto Mears, slices through rugged mountains as it follows old stagecoach routes and former pack trails. A journey that took weeks in pre-car days is now less than a two-hour journey if the road is dry and the driver is able to resist stopping to enjoy the awesome views. 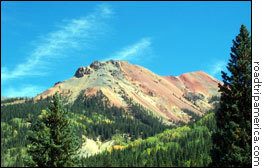 Stunning views of the Yankee Boy Basin area south of Ouray are typical of the area. Farther on, the Million Dollar Highway passes Red Mountain, a collapsed volcano cone whose lava flow was found to include gold in 1860. It is easy to spot remnants of the mining works on the slopes, operations that produced over $750 million of ore. Hiking and biking trails provide access to some of the more memorable mines, including Joker Tunnel, Yankee Girl, and the National Belle. Some abandoned structures are all that is left of Red Mountain, a thriving community of 3000 prior to a fire in 1891 which destroyed most of the town. At 9,318 feet, Silverton is another famous mining town of the old west. Founded in 1874, he town still retains many of the Victorian-style buildings erected in its heyday. In a 16-block walking tour, visitors can check out over 50 historic buildings. Despite the average annual snowfall of over 200 inches a year, there are nearly 500 year-round residents. It is also the northern terminus of the Durango and Silverton Narrow Gauge Railroad. The highway climbs out of the valley past Molas Lake to the spectacular overlook at Molas Pass (10,910 feet). The air on Molas Pass has earned the distinction of being the cleanest in the USA. In the spring, wildflowers abound, and elk, mountain goats, black bears, and mule deer are often visible from the road. Shortly after passing over Coal Bank Pass (10,640 feet), there are breath-taking views of Pigeon and Turret Mountains (both 13,000 feet) and three other peaks that measure in excess of 14,000 feet: Windom, Eolus, and Sunlight. The expansion of the famous Purgatory Ski area has brought improvements to the road. 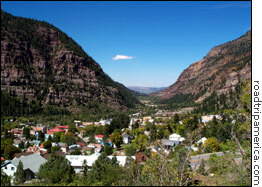 Durango was established in 1881. 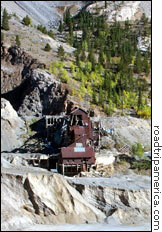 Unlike the other towns on Highway 550, it was never a mining town. It grew around the depot built by the Denver and Rio Grande Railroad about a mile south of the bustling town of Animas, and serviced the coal and ore smelter operations required by Silverton and the other mining towns to the north. Photographs and history of the region are online. Today, Durango's downtown features several restored Victorian-style buildings housing over 20 art galleries and nearly 60 restaurants. 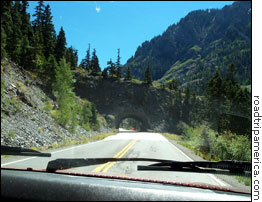 It is still a gateway city for exploring the San Juan Mountains.